With consumers engaging more directly with businesses through mobile and social media, more than 60 percent of CIOs will focus more heavily on improving the customer experience and getting closer to customers, according to a new report released by IBM. The report, entitled Moving from the Back Office to the Front Lines - CIO Insights from the Global C-suite Study, is based on face-to-face conversations with more than 1,600 CIOs from 70 countries and 20 industries worldwide. 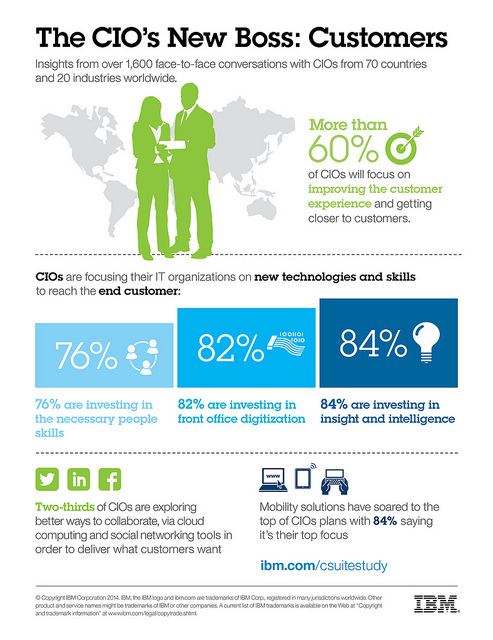 The research, conducted by IBM’s Institute for Business Value, reveals that customers drive CIOs to turn their focus to the front lines. More than 80 percent of CIOs report they are shifting their focus to the front office where marketing, sales and service managers work directly with customers. To do so, they are investing in new technologies to gain deeper insights into customer data. Examples of these items include sentiment mining and social network analysis to identify unique behavioral patterns and reliably predict critical trends. "The study reveals the emerging reality that there is no longer any real distinction between the customer experience and contemporary business strategy," said Peter Korsten, global leader, IBM Institute for Business Value. "The quality and nature of the front-end experience has become the point of entry to the most valuable information any enterprise can possess -- information about its customers, employees, or any other relevant constituent group." CIOs at outperforming enterprises recognize that technology factors will have a significant impact on their organizations, according to IBM’s study. This focus on technology represents a notable shift over the past five years - in 2009, CIOs ranked technology factors as their sixth biggest pressure point behind categories like market factors and macro-economic changes. “There have been significant changes over the past eight years. One big change is accessibility. IT didn’t always have an equal seat at the table. Now, my peers are far more tech savvy,” Nick Smither, CIO of Ford Motor Company told IBM as part of the study research. Getting the basics right has become table stakes for CIOs looking to push their enterprise forward with new engagement and technology delivery platforms. In fact, 66 percent of CIOs believe their IT departments have mastered the basics of technology within their firms. This investment in knowledge and skills is freeing up CIOs to look at new platforms that enable them to build a “Customer-Activated” enterprise. As customer engagement becomes a critical driver for CIOs, cloud computing has soared in importance with 64 percent of CIOs naming it as part of their visionary plans compared to 30 percent in 2009. Likewise, mobility solutions have also experienced a similar jump in importance with 84 percent saying it’s their top focus compared to 68 percent in 2009. With these as a main driver, two-thirds of CIOs are now exploring how to better serve and collaborate with customers using cloud computing and social networking tools.